Here it is! This is my favorite time when writing a new novel. It somehow becomes more “real” in my mind when I can see the book cover. Like the cover for CRADLE, the background artwork for this cover was done by the very talented Polish digital artist, Mariusz Karasiewicz. The original digitial painting named “Space Angel” was the basis for the CRADLE cover, and Mariusz was kind enough to make a couple minor alterations at my request. For OFFSPRING and Book Three (coming in 2013) I wanted to keep the Space Angel and planet element as a sort of masthead across the three books, and use the bottom half below the title as the place where a story-specific theme could be developed. He took my ideas and came up with a completely original concept that he is calling “Space Angel II”. It captures the essence of the antagonist story line in OFFSPRING perfectly. 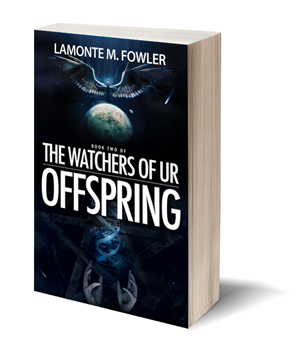 Look for the next book in THE WATCHERS OF UR trilogy on Amazon in November January 2013.